Tyson Foods is shutting down most of a meat processing plant in Iowa because of too much beef and not enough cattle. Tyson said that 400 workers will lose their jobs at the plant in Denison, a city of about 8,000. But they're being encouraged to relocate to Tyson jobs elsewhere, particularly its beef plant in Lincoln, Nebraska, nearly 300 miles away. Tyson (TSN) will keep a crew of 20 workers at the Denison plant who will process non-beef byproducts from other Tyson locations. The company said it's "reducing beef production due to a continued lack of available cattle." Workers who lost their jobs will get 60 days pay, even if they're not on the job. Denison Mayor Brad Bonner said he isn't worried about Tyson workers finding nearby jobs, because there are 500 open jobs in the county, most of them for meat processing. He said one plant is looking to hire 80 workers. "That's the good news about being in Iowa: We have extremely low unemployment rates right now," he said. He said the jobs typically pay $14 to $16 an hour, in an area where monthly mortgage payments of $350 are the norm. 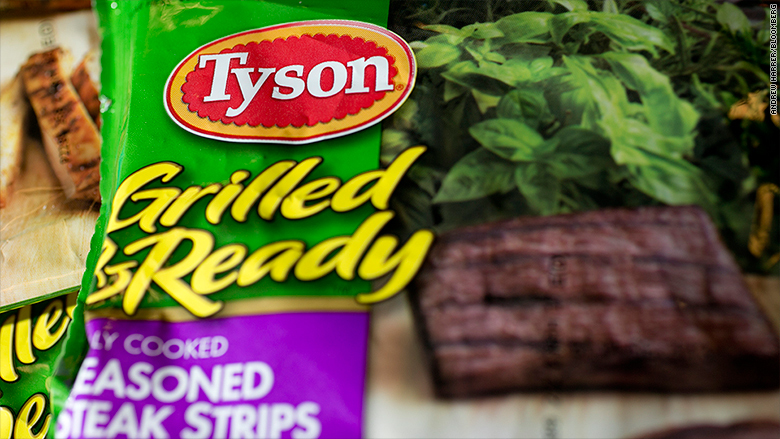 Tyson said the Denison plant was opened in 1961 by Iowa Beef Packers, which Tyson bought in 2001.